Editor’s note: Today I am wearing a custom cashmere sweater with J.Crew leggings, and shoes from Aquazurra. Happy Wednesday! Baby it’s cold outside!!!!! And the rain is coming again tomorrow. More muddy feet for Lacie Rue. I swear she finds the muddiest part of the yard to do her business. I started putting old socks on her feet when she comes in so the mud does not track everywhere. My former assistant Mallory named Lacie Rue’s feet “Grinch feet” since they are so hairy. It’s part of her beauty. We get to deliver outdoor furniture that we ordered just last week for a client who is having a party tonight. It is a miracle that we placed the order last Wednesday and it had to travel from California —-I cannot believe that I pulled off this Christmas Miracle!! I must be living right!!!! The rest will ship in January but there will be enough for seating around the outdoor fireplace for tonight. How lucky for my client that the party is tonight and not tomorrow. We have our awards party with Fort Worth Home magazine tomorrow night at Mitchell Gold & Bob Williams tomorrow night. I am a candidate to receive Best Dining Room and Best Living Space. I won last year for Best master Bedroom. I am excited to see if I can make it a win two years in a row!!!! I hope the rain is not monsooning when we are going and coming from the party!!!!!! I always have to think of my shoes!!!!! I am honored to have been a finalist for two years in a row. I will let you know on Friday if I won!! This morning reading the paper there was a picture on the front page of George H. W. Bush lying in mourning with his service dog by the casket. I did not know about this service dog Sully or the fact that he has his own Instagram page. I looked it up— Sully has 214,000 followers!!!!!!! That warms my heart that there are so many dog lovers everywhere. Seeing that today is the service to honor Bush I thought that I would write my blog about his dogs. Politics aside.... Bush was a fine man first and foremost. His love story with Barbara is heartwarming and any man that loves dogs has to have a warm heart. He had a life well lived.... followed his sweet wife to heaven eight months later... and his last words were telling his son he loved him. May you Rest In Peace George H. W. Bush. Have a fine day and enjoy these heartwarming pictures! 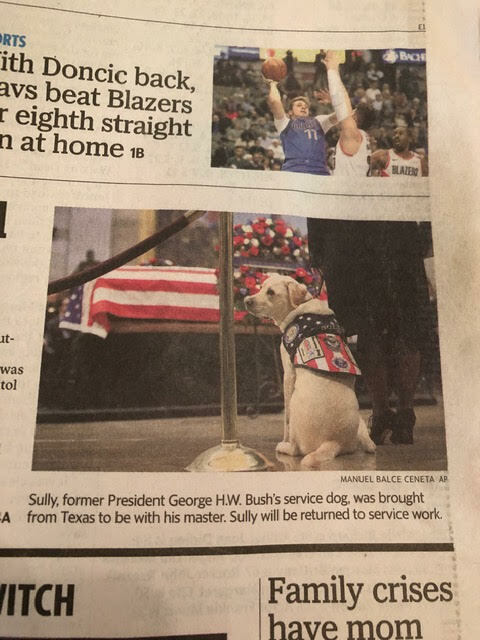 Sully was on his way to be Bush’s service dog. He will be assigned to another person now. My Pax was training to be a service dog. His hips were not strong enough to drag a person... so he was put back in Golden Retriever Rescue to be a house dog. He used to transport things to the front window of our house too pay homage to my husband. The funniest was a six pack of Diet Coke and his briefcase. Can you imagine seeing him carrying those thins in his mouth across the house??? I loved that sweet dog! The Bush’s dog Millie had her own book!!! A young Bush walking across the White House Lawn with Millie and her puppies. What a precious moment!!!! 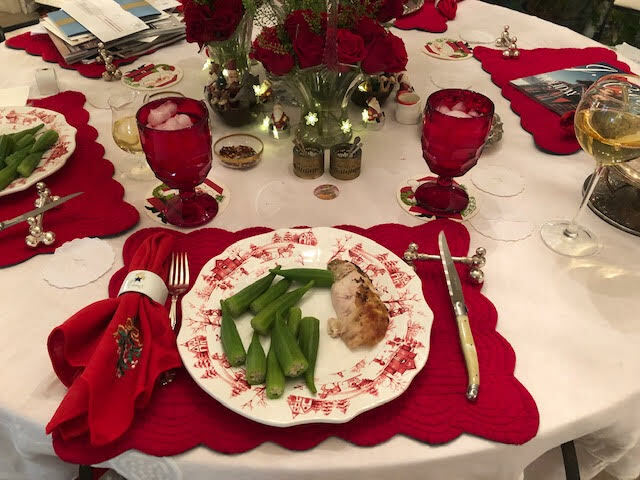 Dinner last night was oak and garlic chicken from Central Market and steamed okra. This song brought tears to my eyes when I heard Rod Stewart sing it. I used to sing this song to my children every night before they went to bed.